The job was a pair of Honduras Mahogany doors with a “woven look”. The interior designer would let me fill in the details. The only other particulars were 100" tall and 36” wide. For a new upscale restaurant. We aded 2-14" thick so we could use 10/4 Solid Mahogany. The problem solving - one of our favorite things - started right away. First up was some sketching, but they lacked what I lacked - the ability to portray that pesky third dimension, critical to a woven look. So, I moved onto wood, settling on 6” squares of 8/4 Oak to shape and play with. I then started thinking in terms of tiles - a major step towards a solution. Two sides were to have plows and two would have tongues. As I started roughing that in, I realized something else critical: I did not need a bowed side and a hollow side, only bowed or convex. The concave is implied, but never visible. Heck, this was getting to be easy! The next step was Justin’s realization that squares were not the best way there, so we changed it to where the tiles were 3/4” longer than wide, or 3/4” wider than long. This emphasized the weaving. First with some MDF mock-ups, then once we saw how that helped things, we moved on to some 8/4 Poplar tiles. The tiles would all have grain running vertically in the door, although this is not the only way to go. We did it so we could treat the panel as a solid wood panel, with four tiles wide and 12 tiles tall, all grain running vertically. I think if we were to do it again, we might alternate the grain for an even more accurate woven look and feel. Justin began to build a 20” circular jig that would hold four of the tiles at a time and rotate against a fixed bearing under some 6” straight knives in the shaper. A full plywood top further helped hold the tiles in place while the power feeder fed them in a slow, accurate circle. The tiles were held firmly in place on all four edges, with the plows fitting over solid blocking. The first part of the cut was into the grain, exiting with the grain. We wanted to make the curve cut in one pass, smooth and accurate. We already had 12 cuts on each tile to make, after they were S4S'd to size. We did not want to add more unless absolutely necessary. The cut was not huge, but soon proved too much. The “Jig of Doom” was immediately a problem. Wonder if you could run the rotating jig on an edge sander. Wouldn't give the sweet surface of the straight knives though. David, It's not one clean pass but you could make your jig to slide in the T slot until it hits a stop block that puts the piece at center of cut making sure the piece is positioned in it's rotation so when you slide the jig into the cut you are cutting from center of face through end of face. then flip pieces end for end and the second cut will be down grain as well. Holding them in place is going to be a trick no matter what. Same jig on the bandsaw first set to leave a little. Fixed splines on the jig, upper spline on hinged arm with hold down. Perhaps I am misunderstanding this, but could you not have run linear footage of this profile through a moulder? The curvature on the top face, and the tongue and groove that would run with the grain could all be run in one pass, leaving the ends to be done after the pieces were cut to size. Even on a shaper, if you have the capacity for a 6" knife, the curvature of the cut would extend less than half an inch; not a real danger in a profile of that size, and still allowing for lineal footage production. Maybe I have my eyes crossed, and am not seeing something. Is there a reason that this is not just another "moulding"? Good point on the molding. It certainly was considered. Half of the parts were 5-1/2" wide x 6-1/2" long, with the grain running the long dimension - vertically. The other half were 6-1/2" wide and 5-1/2" long, with the grain running the 6-1/2" dimension, horizontally. If we were to make these again, I would aesthetically like to have all the grain running the long dimension from end grain to end grain. This would not allow parts to be processed linearly. So yes, we considered running the parts as lineal, with the curve. But, we could only do that to half the parts. Then they would have to be cut to length and plowed on the ends. The other two long grain plows could be done linearly (word?) on the shaper, of course. The two things that caused us to look elsewhere was that we would still have to run half the parts upright, in a jig of some sort, like the "Jig Of Doom". And after cutting to length, we had to plow both ends, accurately. With no more flat face to sit upon, it would require yet another jig, and more passes. Matching the other plows would be important. We opted for the 'one jig does it all' solution, thinking it the simpler path. I still think it is. The problem we had was the knives slamming into the part, and either catching the end grain and splitting off pieces with the horizontal parts, or with the parts with the grain running vertically and taking off the entire front of the part. We bevelled the cut, removing about half the wood. The curve left a 1/8" flat on the part, and ran about 13/16" thick up onto the flat of the face. Not a lot of wood, but that end was being made thin as it was being cut, and despite solid support right there, nothing could hold that end. It would flop just enough to catch and explode. I think future changes would include the same things we did, but I would add a chip breaker to support the wood right at the cut. That could make all the difference. A spiral head would also be sound strategy. The way we solve these types of problems is to develop a strategy first, then evolve it, then try to find the week points, eliminate or mitigate, then evolve it, then start making some rough samples. some backing up and restarting is implied. One just hopes you do not have to back up all the way. I strongly resist starting over for some reason (admitting failure? ), but there are times I would have benefited from starting back at zero. 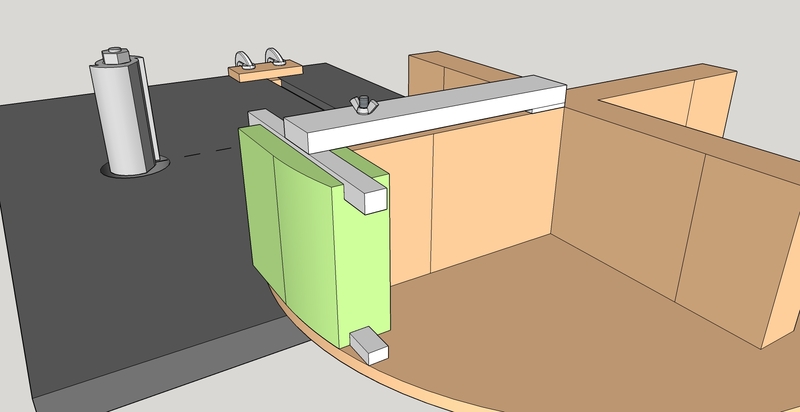 Staying committed to a design, a jig, a method that is not the best is not good personal policy, and not good for a shop or co-workers to deal with. 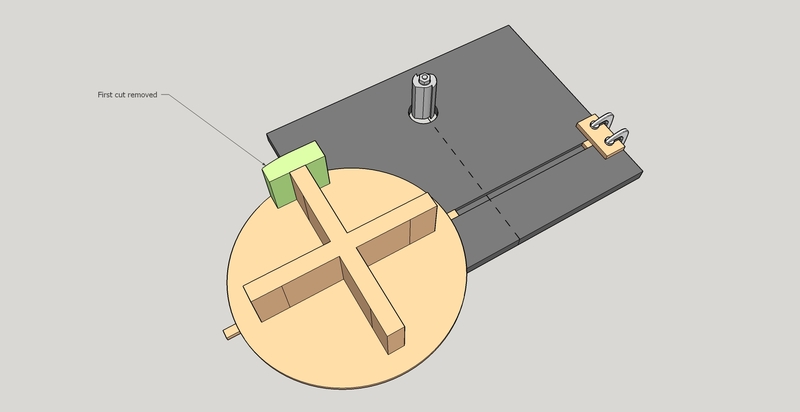 I think that if I were to make this profile with half of the pieces having the grain running perpendicular to the curvature, I would use a pantograph router setup. This would allow you make the curvature on the pieces irrespective of grain direction; just turn the grain 90 degrees on the piece being made. Very safe and very repeatable. Plus, I'm sure you could find other uses for that device. I still think I would opt for sander calibration of the profile even though it would sacrifice the cut quality of a knife. No lost parts to catching/tearout of the grain, much simpler, perhaps a radius jig through the bandsaw to rough and a final on a sander with 180-220 and done. Running the material in long profiled lengths would ultimately seem to the the smartest option if you were making doors in quantity. For a small run not so much. Its awesome to have someone willing to allow us into the thought process of such an operation if only for a personal exercise. Looks like a good application for a cnc router. Lacking that, Mark's suggestion of jigged edge sander after bandsawing seems a lot safer than running those small parts against the grain on the shaper. How were they secured in the jig? What about edge gluing a few long, narrow strips so that you can mill across the grain just like you would with a typical board, then chop them to size. Could cut around glue lines to keep the single piece look. I know this is not what you are looking for but your door project made me think of this Vermont rocking chair manufacturer. His chairs are on display at the highway welcome centers at the VT borders. He makes his somewhat quilted look chairs using ropes through the blocks. They are actually very comfortable to sit in. I doubt this will have much impact on your chain of thought here but figured I'd post the link anyway.